Jacinda Hunter: Driving Force from Prana Living on Vimeo. Today the psyche series spotlights Jacinda Hunter. 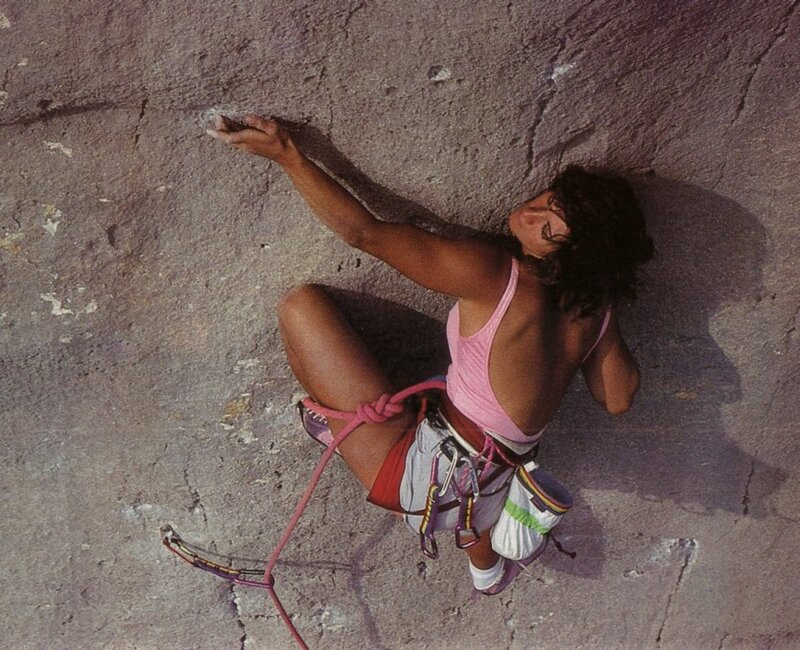 The mother of four, who also has a full-time career, recently did the first ascent of a 5.14b (if you don’t know climbing this is one of the hardest female first ascents in history). The next time you think you’re too busy to follow your dreams think of her. Thanks to Mike Call for the vid, Ryan Wedemayer for the pic, Prana for their athlete’s blog, Deadpoint Mag for the article on staying motivated in the winter (highlighted below), and Jacinda for the psyche. I’m off to go train now. There aren’t transition phases built into the Workout From Hell. That’s not a mistake though, to be sure, periodizational training wasn’t as common in the 80s as it is today. When each phase of a program follows a straightforward progressive overload principle transition phases aren’t as necessary. Let’s take a brief overview as why you sometimes want to transition between phases and other times you don’t. In its simplest sense it depends on the total intensity of the program you’re doing. In P90x, for example, you’re simultaneously training across various energy systems to your maximum. Your body is stressed in many various ways so that there is a pretty short window of opportunity for improvement before hits a plateau from simply overstressing itself. Another modern program, Turbo Fire, combines HIIT (high intensity) training with more traditional cardio (low intensity) and bases its transitions (recovery phases) on the overall intensity of the phases so the amount of time between transitions varies throughout the program. Because the WFH only targets one energy system in each phase, which changes every three weeks, you don’t need a week of doing something different in between to adjust (like 90x). You will find, however, that your body can’t react right away and this provides you with a self-induced transition phase. When you drop your repetitions the first workout or two are a learning experience. Your body has become accustomed to doing a higher number of reps (time) and there is an adjustment period as it tries to recruit higher threshold muscle cell motor units (intensity). To aid your body’s transition I recommend beginning the first few workouts in a phase with exaggeratedly slow movements. In the WFH you shouldn’t be moving fast anyway but, in almost any program, when you begin a new phase you should concentrate on technique first. Only when technique is mastered do you want to begin to push intensity (weight, speed, etc). Keep in mind that intensity doesn’t equal hard in your mind. Intensity is defined by how stressful an individual exercise is on your body, not how hard it feels. Low intensity workouts can be very hard and painful. Try riding your bike for 8 hours, or doing one of Debbie Siebers’ Slim Series workouts. There are no hard movements it still hurts. Conversely the most intense exercises might not hurt much at all (unless you get injured). A box jump wearing a 40lb weight vest won’t tire you out but it will put incredible stresses on your body. This is why there are times, especially in a complex program like P90X, where your recovery weeks can feel harder than the rest of your program. Shatner is such a vegetarian, he even loves his ladies green. Today, I'm going to let a true master do the talking. Pour yourself a cup of coffee, pull up a chair, and enjoy Vegetarian World, starring William Shatner. I'm not going to bother posting this video here. Instead I emplore you to visit his site and check it out. I’ve been asked to blog more about supplements so I’ll start with a post on what I take and why. As many of you know, I’m referred to as Beachbody’s white mouse; meaning everything we make gets tested on me first. But I don’t just test what we make. A lot of what I test ends up on the cutting room (or is it bathroom?) floor. Over the years I’ve tried hundreds, if not thousands, of supplements. My impression is that supplements are over-hyped and most are a waste of money. There are, however, cornerstones that I use as part of my daily diet and an occasional supplement I find vital for max performance in a given situation. The problem with supplements is that we hype them the same way we do drugs. They are not drugs. The upside to this is that it’s VERY hard to hurt yourself with supplements. The down side is that our expectations tend to be too high. 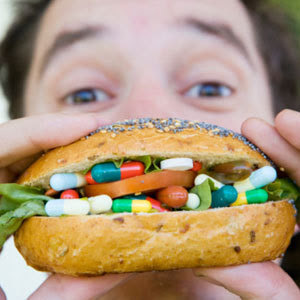 Supplements are food, or condensed food. Most can be consumed in their natural state and, if we ate well, many would be unnecessary. While this means they tend to be safe it also means we don’t “need” them. However, using proper supplementation strategy can help us live healthier and perform better, especially when we train hard and even more importantly when we’re dieting and exercising. I break my supplements into basics and situational. Basic supplements are things I take pretty much all the time. Situational are those I use depending on what I’m doing. Let’s look at these first. In the same way that your diet should reflect what you are doing, so should the supplements you take. 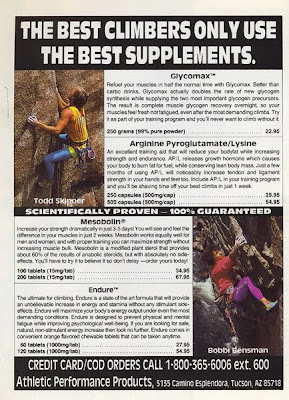 For example, two of the most proven supplements in history are creatine monohydrate and 4 parts carb to one part protein recovery formulations. Neither are daily tonics. They are for given situations. Creatine is useful when you’re training hard and trying to build muscle or anaerobic strength. If those are not your goals it’s not only a waste but can interfere with your diet by encouraging your body to retain water to increase cell volume. Recovery formulations are only for when your glycogen stores are extinguished which takes hard exercise or starvation. No one eating well and exercising 30 minutes a day or less would ever need a recovery formulation. In fact, it would be terrible for you. However, when your training hard, eating lean, and using up your body’s limited glycogen stores the stuff is more valuable than gold. Basics are things you should take everyday, like food. Since it came out Shakeology is on the top of my list. It’s like a healthy insurance policy in a glass. I begin every morning with three Joint Support Formula capsules, one Core Cal Mag, two Omegas, and an Activit tablet. At night I take another Cal/Mag tablet and a vitamin with my Shake. I look at this group of supplements as part of my diet and nothing more. Besides situational supplements that I know work I’m often playing my white mouse role by experimenting with something new or different. Currently it’s this protocol, and the jury is still out on what I think of it. My next block of training (experimenting with The Workout From Hell) is going to include something different, which I’ll report on if it’s effective. I’m also playing around with coconut oil and chia seeds. The latter is just a food but hasn’t become a staple yet. I think it will become so. I’m not yet as sure about coconut oil’s status as medium chain triglyceride. As fall rolls around and I begin to care more about my performance I’ll stop experimenting and revert back to proven supplements that work for whatever my goals are. Since I just finished another pump-inducing WFH workout it seemed like a good time to post on cortisol. Back in the 80s it wasn’t a big topic. Well, it actually was a big topic but marketers had yet to catch wind of it so no one talked about it. But, if you’ll recall the no-fat phase that ran from the late 80s to early 90s, cortisol was a big reason behind what was going on. First off I should explain what cortisol is. But I’m not going to. Denis Faye of The Real Fitness Nerd has done a perfectly good job in an article archived at Beachbody. Click on this paragraph if you’d like to know more about it and what you can do about it. Cortisol has various tasks. It's instrumental in controlling blood pressure, and it also supplies emergency energy to the body. It does this by decreasing insulin sensitivity and stimulating something called gluconeogenesis, the creation of new glucose from amino acids. Unfortunately, these amino acids come from the breakdown of body proteins through a process known as catabolism. In other words, during times of stress, cortisol aids in breaking down muscle mass for use as energy. A few years ago, a wave of supplements hit the market vilifying the stress hormone cortisol, claiming that it caused an accumulation of excess fat. While this "fact" helped companies like CortiSlim® sell plenty "cortisol blockers," there was a tiny problem. It's complete hogwash. So let's set the record straight, shall we? What I’m going to discuss today, which the article doesn’t go into, is the bird’s eye view of cortisol and how it affects your workouts and your results. I mentioned it in a 80s post because one of the no-fat era’s poster ailments was anorexia. Most of you know what it is, I’m sure, and cortisol is a big part of it because when you don’t eat your body releases excessive cortisol in an emergency response to lack of calories. When this happens regularly you get into a vicious circle of chronic cortisol release, which keeps catabolizing your muscle tissue, not to mention throwing your body’s hormonal cycles off which can lead to major illness over time. But cortisol issues don’t just happen to anorexics. Everybody beginning a new training program goes through a period where they produce excessive cortisol. One of the things that happens with excess cortisol is released is water retention. When we retain water we feel bloated and this bloated feeling can lead us into another Catch-22 situation where we either stop eating or stop training hard. It’s vital that you do neither. Cortisol is somewhat of an emergency hormone. You are supposed to get more of it when you’re under stress because it enhances your performance (it’s a banned PED in sports). When you are training you release more in the adaptive phase of a program. As long as you stick to your diet and exercise program (assuming it’s of sound design) your body will adjust. You’ll stop retaining water and your performance will increase as will your results. What often happens is that we react to this temporary weight gain and exacerbate the problem. Women often mistake this as building muscle mass and quit pushing their weight workouts or quit the program they’re on. This always infuriates men who only wish muscle could be gained in a matter of days! Men, however, especially fit men trying to gain some mass, sabotage their programs by getting scared about losing their ripped abs and stop eating at a time when your body needs more calories than normal. So I guess the whole point of this post is to tell you to see your program through to its end. By cutting it off early you don’t give it a chance to work as it’s designed. 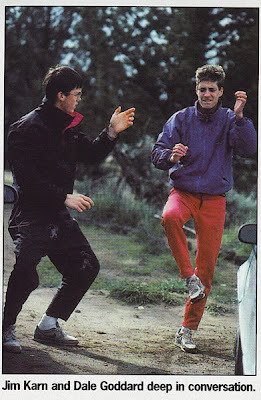 It’s also an excuse to post a pic of some more great 80s fashion. My workouts in the WFH aren’t 100% about climbing. I’m also a cyclist and runner and, though injured, I’m not willing to let the muscle groups that support these activities slide much in order to climb harder. I once made this sacrifice. I’ll go into depth on how during the power phase of this program. Today I’m just going to address what I’m doing that doesn’t facilitate my climbing endeavors, mainly because I’ve been asked about leg work during the program. 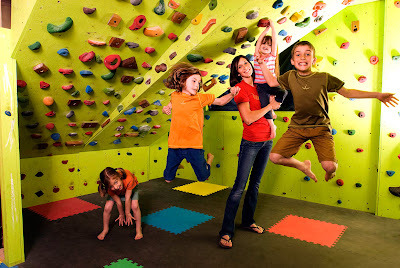 While they need to be functional, legs are little more than dead weight for a climber. It’s funny that so many climbers are also cyclists because the body type needed for maximum performance in each is 180 degrees opposite. Cyclists have massive strong legs and try and keep their upper body muscle to an absolute minimum. 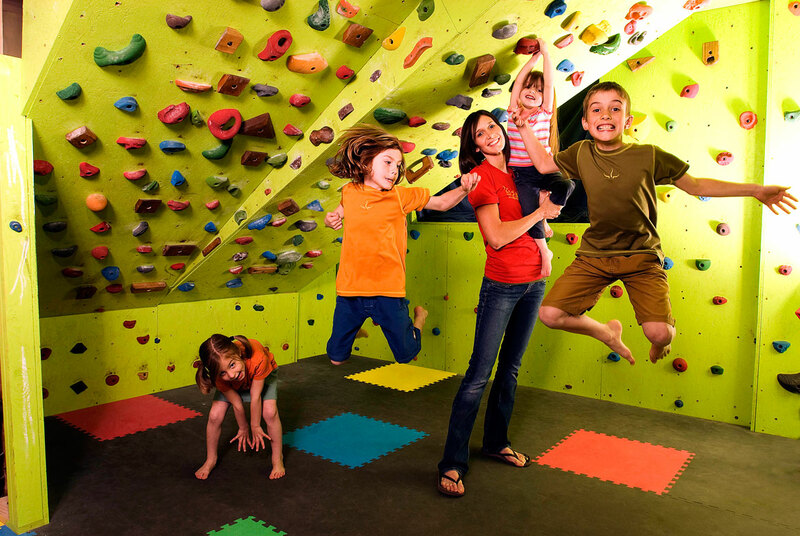 Conversely, climbers build their bodies to resemble apes. Since I want to do both at a reasonably-high level I need to compromise. My WFH journey mainly started with an injury to my back that didn’t allow me to either run or ride. Now that I can do these a little I’m slowly bringing them back up to speed. Day 2 on the schedule includes legs, which are done at the end of the workouts. And at least two days a week are devoted to some “track” drills for running, usually done as my warm-up for the day’s workout. These are day to day activities. What I do is simply what I can do. Right now it ain’t much. Because this is climbing-specific journal the details are not important. I just wanted to point out I was doing more exercise than listed. Most of us have some other interests in life. Whether those interests are sports specific, wearing tank tops to school, or looking good naked it’s important to note that this program can still accommodate your interests. vids: in the 80s, no one exemplified the important aspects beyond the climbing lifestyle like patrick ‘the dream maker’ edlinger. note the subtle differences in the original version and the more straightforward parody. after all, when it comes right down to it, none of us can dispute the importance of german techno music about robots. I was asked to critique Dr. Mercola’s critique (like the show we once wanted to do where we came on after Sneak Previews and critiqued Siskel and Ebert’s movie reviews) of a USA Today article on how short, intense exercise is better than long, easy aerobic exercise. We’ll begin right after this word from our sponsors. I actually view exercise as a drug with regard to being properly prescribed and having proper dosage, And it's one that you can readily substitute for some of the most common drugs used today for things like diabetes, heart disease and depression. All of these conditions will improve with exercise and with the help of an experienced natural health care clinician. This article is definitely worth a read and my only critiques are about its hyperbolic nature. The idea that short and intense exercise is better is not new, as he states. Those in the business have always known it. Granted, it isn’t the way mainstream health clubs or the medical community has spun things but, as I’ve stated before, this has a lot to do with liability. Many professionals are afraid to prescribe intense exercise because of lawsuits. It’s much safer to advise walking around the block. If you look at our Beachbody products we’ve always used intense exercise done in an interval format. This goes back 12 years but we’re playing on principles that have been around all of my life. Sports trainers and coaches have always known (I would submit the Greek’s knew this) that for maximal performance you need to train every energy system and stress the muscle fiber types that are specific for performance. We are pitching HIIT training with the new Turbo Fire program but, remember, our very first products (Great Body Guaranteed) were intense 10-minute workouts. And the powerful link between diet and exercise he addresses is, indeed, the cornerstone of our company. We don’t just provide exercise programs, diets, or supplements. We sell the entire package. So, again, there is nothing new there from our perspective. I mean, he’s even teaming up with Kathy Smith and she is one of our trainers! Where there is some confusion amongst Beachbody-ites is in his dietary guidelines where he recommends not eating, especially sugar, after your workouts. He’s not wrong here because the entire article is addressing 10 minute workouts only. I will, however, take exception with the growth hormone spike window being up to a couple of hour when the research I’ve seen shows this happening within about 20 minutes. But, more importantly, in 10 minutes you cannot extinguish your body’s glycogen stores. When they are exhausted, however, your nutritional needs change and sugar becomes vital because the longer it takes to recharge those stores the more damage is done to your muscle tissue. This is why we recommend Recovery Formula with our longer workouts like P90X and Insanity programs only—and with Turbo Fire in it’s later stages—and not with programs like Ten Minute Trainer. Different situations call for different nutritional strategies. And that’s nothing new for us either. But do give the article a read. Mercola makes you sign up for a free account and sends you newsletters daily. And while I wouldn’t blindly believe everything he says it’s probably a lot more valuable than watching Fox News. The Straight Dope says two thumbs up for Dr. Mercola's critique of USA Today. 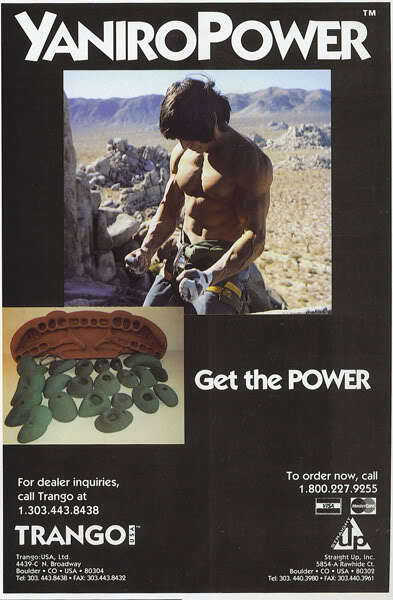 Climbers can’t afford a lot of beef. Gravity is too forceful. Gaining weight will offset any strength gains you can make so it becomes vital to only allow hypertrophy happen in muscles that you need for climbing. Large muscles may look good on the beach but they are anchors when you’re hanging off of one digit. This is why the Workout From Hell is structured the way it is. Most hypertrophy is gained when you fail between 8 and 12 reps, which is why there’s a phase of 15 and another of 5. We're doing our best to avoid gaining mass. Some hypertrophy will occur. There is no way around it and, frankly, it can be helpful if done right because your muscles need to function in balance. To accomplish this it’s important to both keep your schedule focused on climbing muscles primarily and to make sure you hit 15 reps. The latter is easier said than done as most of us are conditioned to fail in the 8-12 rep range. Eeking out those last three are vital. You should fail on occasion, of course, but don’t get in the habit of always picking up too much weight and failing early. Largo said the 15 rep phase is for strength. While technically inaccurate—never tell a strength coach you’re doing 15 reps for strength without expecting to be slapped—you are teaching your muscles that got conditioned to endure 30 reps to re-focus on 15. As your engrams engage you are actually getting stronger. So Largo was correct even though you’re not working on muscle cell motor until recruitment. My schedule is varies somewhat from the 30 rep phase. My reasons for changing are personal. Yours should be too. So instead of just reading this and following along you should assess your strengths and weaknesses and alter the schedule accordingly. I couldn’t do even easy yoga for a while but now I can. I do Rodney Yee’s Back Care Yoga as a warm-up. This, of course, is very specific to my situation. I’ve described the new hangboard routine. I climb outside once or twice a week but only on easy routes, 12a and under, and I only do short sessions (up to about 6 pitches). Front pull-downs get moved to day 2. This is interesting and personal. Using bands for 30 reps my rear delts were taking the brunt of this exercise early on because I was out of balance in this area and, using bands, the elastic force created more need for stabilization. Now they are mainly a lat exercise. In place of these I’m doing forward bend lateral raises at about 30 degrees and have replaced the standing lateral raises to front raises. I’ve stopped doing the band overhead tri extensions and replaced them with chair dips. I now do five back exercises. The first is band pull-downs which just aren’t that hard so they are like a transition exercise between the warm-up and the workout. I then add front pull-downs for a fifth exercise. I then subtract a chest exercise. 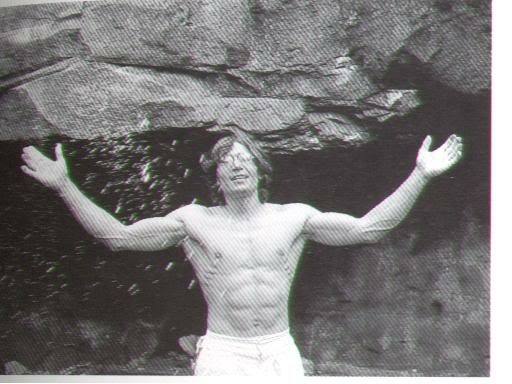 My chest, while not big, is much bigger than it needs to be for climbing. I consider each movement done here to be fairly climbing specific. I’m adding more legs and core as I can. 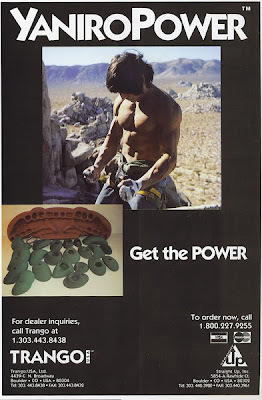 Most notably I’ve begun using the Ab Roller in sets of 15.
pic: kauk and gullich beef it with sly to morph into hollywood-approved climbers. I’ve finally found something to post on the World Cup. Joe Posnanski’s SI piece, called The Glory of Spain, is part II of the psyche series. The article is written from the perspective of an American who was raised on the game, moved on, but motivated by the Spanish side to embrace his roots. I love the Cup. It’s my one television indulgence. Every four years I carve up my schedule to accommodate as many matches as I can. This year I even managed to pick the right team to root for. To be honest I rooted for the US and Mexico, my home soil, first and foremost. But I held little hope of either winning the Cup. For that honor I wanted to see a side who hadn’t won before. Luckily Spain fit the bill and also happened to be my favorite team to watch. They play amazing and skillful football. Truly the beautiful game. Never mind if you only saw a final marred by fouls and think that’s proper footie. It was the Dutch solution to disrupt an unstoppable force. Posnanski sorts it out. It was gripping because Spain didn’t win those 1-0 matches with thuggery or by playing everybody back deep or even with stout defense. No, they won matches with their sheer brilliance at keeping possession, passing the ball to each other, showing off their preposterous talents for handling the ball. You couldn’t get the thing away from them. The Spaniards were like pool hustlers running table after table, like Fast Eddie Felson in “The Hustler” who, when told by Minnesota Fats that he needed to quiet down and shoot pool, snapped off: “I am shooting pool, Fats. When I miss, you can shoot.” Yes, that was Spain — when they gave up the ball, you could have it. Only they didn’t give up the ball. Sooner or later, they would wear their opponents down with the sheer skill of their play. And once those opponents were properly worn down, Spain would strike. To be fair, Spain’s streak of 1-0 matches probably wouldn’t have happened with a different draw. En route to the final they came across a Swiss side in the midst of setting the record for most World Cup minutes without giving away a goal, a Portuguese team who had risen to #3 in the FIFA rankings purely by not allowing goals, and overachieving Paraguay who’d yet to give up a goal in the tournament, obviously motivated by one fan’s promise to run naked in the streets if they won. It wasn’t all about Spain, of course. Great moments happened throughout the three weeks. The US winning its group in the dying seconds, the brilliance of Uruguay’s Diego Forlan, and Ghana’s spirited run getting heartwrenchingly snatched away too early are a few that come to mind. And we mustn’t forget the Dutch, now the best footballing nation to have never won the cup. This looked like their year. After all, they’d taken down Brazil, FIFA’s #1 team who until be baffled by the Orange hadn’t had a close match. But in the end, as Posnanski’s father told him, football is about the touch. And no one can touch a football better than Spain. I’ve got to say the Interweb is pretty cool. I run across a lot of inspiring articles and videos that it wouldn’t have been possible back in the day I was doin’ stuff when we relied on such artifacts as film, slide projectors, and live audiences. Since I feel that psyche is such an integral part of what makes us, well, us, I’m starting a series of motivational pieces from things I find in cyberspace. Hassan is beginning his Workout From Hell program today so I’m kicking it off with a short Mammut video of some Euro kids who climb harder than almost everyone. I've picked this because Hassan is younger than all of them and just began climbing. Hey, man, this could be you in a few years. It does make me feel a bit old. Seeing vids like this reminds me that climbing is a game of youth, something I often tend to ignore. More and more it’s trending, like gymnastics, to where its top protagonists are often well under legal drinking age. A cool thing about climbing is that, unlike gymnastics, those of us a bit long in the tooth can enjoy pretty much the same adventures as those at the top of the sport. The holds we use are just bigger. Someday I’m heading back to Rumney and taking the whip at the top of Predator, just like these kids. Hassan, you should join me. We have a new supplement guy here at Beachbody. His name is Dr. Bill Wheeler and he’s got a lengthy and impressive resume and will take our game to a new level. We’re working on improving most of our current supplements and adding a ton of new ones, as well as obtaining state-of-the-art certifications for everything we make. But we’ve got to keep our work conversations focused because when we get together we seem to drift off into what the latest research is showing and then theorizing about how this could lead to breakthroughs in diet and supplementation. This is often way beyond the scope of what we’re going to provide our customers in the near future but for me, as a human lab rat, it gets my brain spinning over possibilities. Currently, however, I’m doing sort of the opposite. Along with the WFH I’ve begun a retro supplementation regime. Over time “de rigueur” supps come and go but, occasionally, things that work well fall off the radar for no good reason. Back in 1990 I was experimenting with a line of supps from the company in the pic. These guys had some fringe stuff and ended up getting closed down when some of their biggest sellers went onto the banned list. I’d become a test pilot for them during a period where I made tremendous fitness gains. I didn’t associate much of this to these supps but I’ve decided, given I’m in the business and all, that I should give these another run around the block. The only supplement I’d used from these guys that got banned with GhB, which became a popular party drug and ended up killing a few celebrities who OD’d on it. I used it for recovery as well as to help me get to sleep. 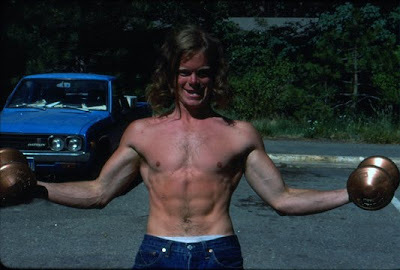 In 1990 I was trying to revamp me body from one of a lower body power athlete to an upper body endurance athlete. 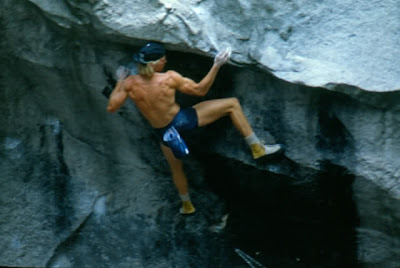 I was simultaneously catabolizing leg muscle while building up climbing muscle (back, shoulders, arms) which meant I was doing some wild training and eating a very low calorie diet. When you’re doing this it’s hard to sleep because you’re amped at night like Louden Swain in the 80s film Vision Quest, but that’s another chapter in the Workout From Hell saga. Today I’m just announcing that I’m experimenting with Arginine/Pyroglutamate/Lysine and what they called Mesobolin. There's probably a reason they've never gotten popular but I’ll let you know how it goes. Now, if you’ll excuse me, I’ve got some studies to read on the difference between "fast" and "slow" proteinsm something on the fringe I just learned about from Dr. Bill. With block 1 in the books I finally get to start lifting some weight. Largo says “you'll savor going to the gym because you don't have to crank off 30 reps on every exercise” and I would tend to agree given I’ve been thinking about what 15 reps will feel like over the last week. It’s time to add some weight and actually feel as though I’m getting stronger. It’s also time to get a little more nitpicky about my diet. After block one I feel good. I’ve lost about a pound and my body fat seems to have dropped a touch, or not much change as expected. The only downside is that an old shoulder injury flaring up, which was expected given that I’m pretty sure something in detached in the joint (which is quite common for athletes). The drop in volume will help this. My back is also getting slowly but steadily better. At this point I’m certain it’s a re-herniation of L5S1 but it ultimately doesn’t matter. I know the drill. If my rehab doesn’t work I’ll require cortisone and/or surgery. The schedule for block 2 remains the same but many of the movements will change along with the repetitions. Largo emphasized standard lifting movements but, as I said at the beginning, I feel it’s important to focus on exercises that relate at least somewhat to the muscles you need in climbing. Even doing 15 reps, which is technically muscular endurance, will create some hypertrophy and avoiding adding mass that is not responsible to sports specific movement is vital. No strength gains can offset the effects of gravity. I’ll spend the first week experimenting with movements and post them later. If you’ve been training for awhile and you believe your body can take the punishment, then this higher volume workout may be better for you. Choose 6 grip positions, then do 3 sets on each grip. The first set I do seven reps each 7 seconds long, with 3 seconds rest. The second set is six reps of seven seconds with 3 seconds rest. The third set is five reps of seven seconds with 3 seconds rest. I take two minutes rest between each set within the grip position, and three minutes rest between each grip. I also begin to diet. Namely, I’ll begin to zig zag my caloric intake. I’ll begin with 4 days “on” and 3 “off” and transition to 5 and 2. During the on days I’ll limit calories to around 1500. Off days will be closer to 3000. Since the volume of my workouts is down from normal (I do a lot more exercise than most people) I’m not sure where this will settle in. As with all dieting some experimenting is always necessary. One key element is that on my low-cal days I need to get some protein each time I eat. I’ll go into why in a later post but the gist is that when workload is high and calories are low it’s vital that your diet has as much protein as possible and eating small amounts often is the best way to make sure of this. pic: we didn’t just have a yaniro board back in the day, we still have one. 20 years on and it’s the de facto board at the shed, in santa barbara. Good balanced vitals, a basic multi-vitamin, plus a little extra C seems to do the trick. I also tried to drink a couple of light beers an evening for no apparent reason at all! In block one I’ve altered this very little. Shakeology in place of the vitamins and striking the light from the beer is the extent my diet so far. Beer is worth some discussion at this point because comparing mass produced beer, even light, to microbrews is like comparing Wonderbread to homemade whole 9-grain. 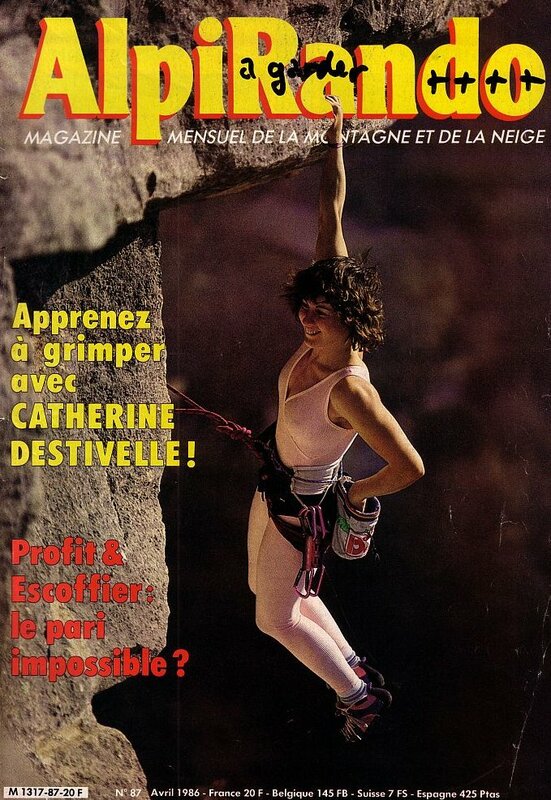 Beer has a long history in fueling climbing performance. Inebriated pub banter has led to some of the boldest ascents of yore. I personally recall a few hazy evenings in Yosemite’s Mountain Room bar followed with my friends goading me to lead a pitch that I had no business trying because I’d boasted, a few pitchers into the previous night, that “it might not be too bad.” I doubt I’m alone when I say that some of my scariest leads came about due to beer. But that’s not what I’m talking about here. Nutritionally beer can be better than a lot of the junk we eat regularly. Mass produced beer, however, is the junk we eat regularly as it’s made from the same crap ingredients that fill most of what you find at the corner 7 Eleven and the middle isles of your local supermarket. Mass produced beer doesn’t even bother with traditional ingredients and, instead, is often fermented rice mixed with various by products of genetically modified corn and/or soy production. Microbrews (real ones, at least, as the big corporations sell imposters that still contain nothing but junk and are flavored by extracts) actually use various plants (barely, hops, etc) in a combination that has a decent nutritional profile and are loaded with phytonutrients. So when Arnold boasts “Milk is for babies. I drink beer,” in the classic film Pumping Iron, it was only veiled hyperbole. As a performance fuel, handmade beer is nutritionally superior for adults than mass produced pasteurized milk. Beer aside, I generally don’t diet during the first block of an intense training program. You need to eat in order to fuel recovery and I generally eat fairly well. My goal in any volume phase is to fuel for recovery and not to worry about weight loss or any sort of body composition change. Over the course of the program I will make dietary changes in order to address it. If a program has a power phase, as the WFH does, I’ll generally do it then because power requires more rest, shorter sets, and burns fewer calories. For that I plan to dust off another chapter from the archives but that’s a topic for another time. Today we’re talkin’ about beer. And climbing. If you hauled beer up here you’re crazier than I thought. I may be crazy, amigo, but I’m not stupid. I didn’t haul it up here. You did. It’s in your pack. 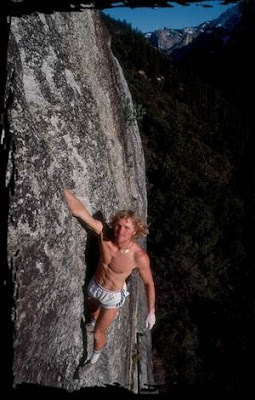 pic: beer is such an iconic part of climbing that it's used in ads, or at least is was in the pre-photoshop 80s. Lance Armstrong likes to talk about how cancer survivors are the lucky ones because they are forced to re-evaluate their lives, often leading to a new lease on life. This analogy isn’t reserved for those with cancer. Anyone who has had a major illness, injury, or situation that’s forced them out of their comfort zone is privy to similar “luck”. Challenging situations can lead to us bettering ourselves. So much so that, I would say, most of us define our personalities when the chips are down. Admittedly that’s a pretty lofty lead-in for a post on core training. But it’s often the smallest details that lead to the biggest improvements. My injury has forced me to re-evaluate what it means to focus on core and posture work, and it’s not a topic I’ve ignored over the years at all. But I can’t help thinking that if I’d done a better job with that aspect of my life (and not just training) I wouldn’t have re-injured myself. In P90X + Tony talks about “engaging your cage” a lot during the workouts. This, no doubt, came from Isabelle Daikeler’s influence on the program. She’s a Chek-ian (my word for disciples of the Paul Chek school of functional training) where all movement begins with the core. And while trainers ubiquitously champion the importance of core strength the Chekians say it’s the fundamental starting point of all human movement. Isabelle’s training style can be a little “out there”. She’s worked with me a bit and it’s fantastic cerebral stuff. We tried to have her create a program for us but it was canned by our CEO (her now husband) because he didn’t think we could sell it to the general public (though he must have thought a lot of it himself). She’s worked with a lot of famous athletes, too. She says “some get it, others don’t.” Those who do improve. I tend to be part of the latter group. I say tend because while I get it I don’t always practice it. Like most athletes I’m far more motivated to do something sports specific, or at least powerful or painful. Her training is balancy and frustrating—like a lot of other training that is took nearly 50 years for me to do religiously. After all, I rationalize that if I can do front levels and weighted leg raises (which most can’t) doesn’t this make my core strong enough? The answer is yes and no. It’s strong enough but not necessarily engaged enough. Just because you have ample strength does not mean that you’re using it correctly. In fact, it can be the opposite because you can get away with not using it correctly. The getting it aspect of core training is not actually the training; it’s the posture part where you teach your body to focus on its core for every physical action. You actually lead all movements with your core first or, engage the cage. My injury has forced me to a place where I’d never been. If I lose core rigidity (not a flexed core but a rigid—contract your core to see where it should be then relax and do the movement) for a rep it hurts. I have a reminder, like an angel, to warn me anytime I’m not using perfect form. Coupled with my long 30 rep sets it’s providing an engrained postural change like I’ve not before experienced. Therefore, what appeared to be nothing but a sucky start to my summer has is instead made me one of the lucky ones. pics: in what apparently is the di rigueur ab pose for climbers in the 80s two fit-looking lads show what a steady diet of off-widths and living out of a van can do for your core. 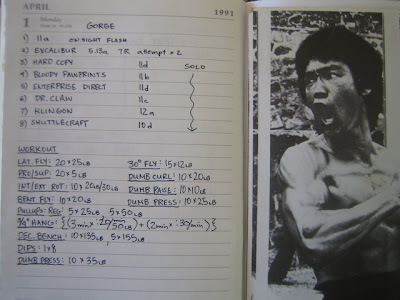 At its core the first training block of the Workout From Hell is about survival. You won’t gain much strength. You won’t gain much muscle. You won’t get ripped. And while you should get better at the workouts they don’t feel any easier the more you do them. It’s similar to why most sprinters hate the 400. Instead of feeling fast and powerful, as you do at shorter distances, the quarter is a war; an internal battle to keep your mind calm and focused while every sense you have is screaming for you to stop. I think it’s vital to embrace this mindset before you begin. Because everyday, at some point during the workout, you’re going to want to stop and there many rational reasons why you should. You don’t look better. You don’t feel better. No one understands what you’re doing. 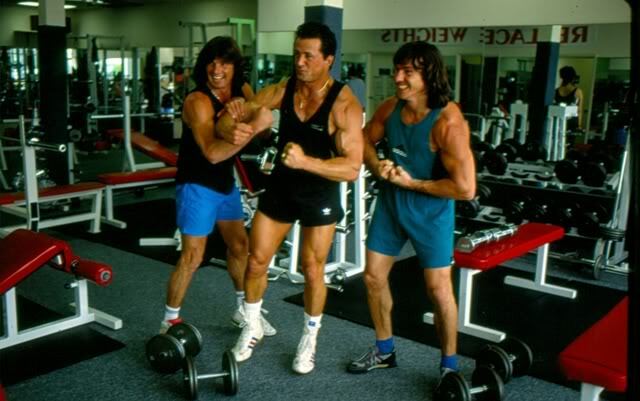 The big guys at the gym are eyeing you quizzically and you aren’t impressing the ladies with those 5lb dumbbells. Mostly you hurt. Struggling for those last 10 reps is almost comically sadistic. If you haven’t convinced yourself you want to fight you will stop. It’s guaranteed. I don’t write down my hangboard workouts during this phase. I increase them by one grip position each workout so they get longer but my only goal is to find holds where I can barely finish each 50 second set (10 on, 5off, X 5). Choosing weight for the resistance movements is a little tricky because you don’t want things to be too easy. But almost any amount of weight gets hard near the end so slightly too light is better than too heavy (especially if you fail under 20) because you want to finish the 30 with as little pausing as you can. I don’t always get this right. It doesn’t matter. The point is to stay engaged in the fight. Block one is about volume. I’ve been asked how you’re supposed to feel and it’s hard to describe. Each set feels as though it’s pumping you out of your mind but you’re not always pumped. Because you’re crossing energy systems during each set it affects your body in an odd way. Sometimes you can barely begin the next set. Other times it feels easy. Others feel easy then you die early in the set. The response to this training is complex. I’ve done it many times over the years and the only thing that’s a constant is that every workout will be painful. Post workout has me feeling weary than anything. You break down very little fast-twitch muscle fiber during this phase so you won’t experience DOMS. It’s endurance work as far your muscles are concerned but there are other physiological changes occurring as well. Joints and connective tissues are being stressed in ways they probably aren’t used to. Oxidative pathways, too. Your entire system is turned on end and confused. Daily response can’t be predicted. Some days I feel dead at night and wake up feeling fine. On others I feel great and wake up stiff, sore, or feeling like I’ve tweaked something. I’m icing my lower back about five times a day because it’s injured but I’ve had to ice my shoulders, elbows, hands, chest, and upper back at various times over the last couple of weeks. I think this is because your body is on edge so it responds more drastically than usual to any unusual damage. Block one of the WFH is always a personal odyssey and I suppose that’s why I like it so much. I’m not sure that everyone needs to experience it. Glycolytic athletes can benefit but, beyond them, I think it’s probably most effective as a plateau buster. If take it on make sure and commit to surviving. Though not visual, it’s where your true transformations will occur. It will make everything that comes later seem easy. pics: dudes, i said survival, not survivor. above 80s sport climbing legends dale goddard and jim karn train for the world air guitar championships at smith rocks but when you look at their style there's little question they hold faint hope of usurping aussie teen idol geoff weigand, top.